Last week Lyn went shopping for a few things on her own and there were a few impulse buys. We all do that I did it yesterday and ended up with American Chop Suey nice comfort food for a snowy day. Anyway she got a 4 lb. boneless leg of lamb. I used 1 lb to make ground lamb last weekend for Gyros. Today we made this roast and it was well worth the impulse buy well worth it. 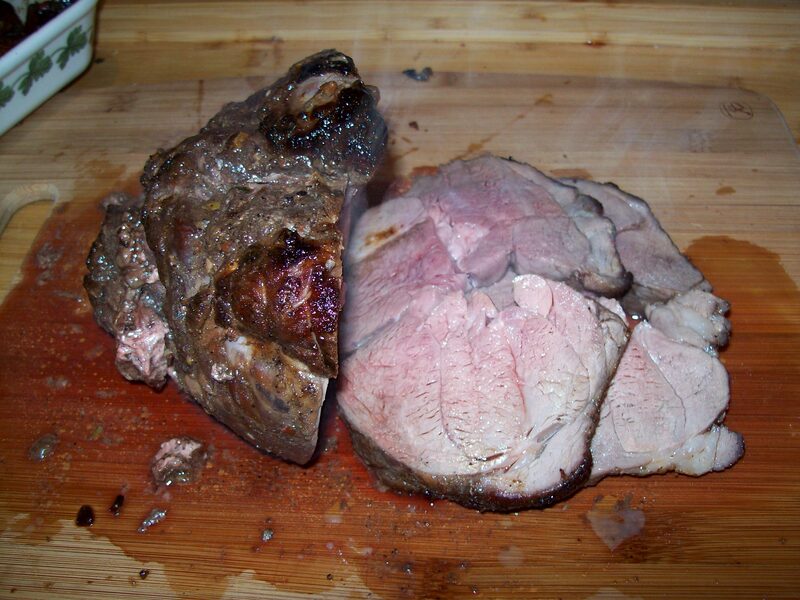 Look for a mini boneless leg of lamb roast that weighs approximately 3 lb. These small roasts sometimes come prepacked in netting. For a leaner, cleaner tasting lamb we like to trim the fat off the surface. This requires removing the netting, trimming the fat, and retying your roast. The extra work is definitely worth it. 1. Adjust oven rack to middle position and preheat oven to 350 degrees. 2. 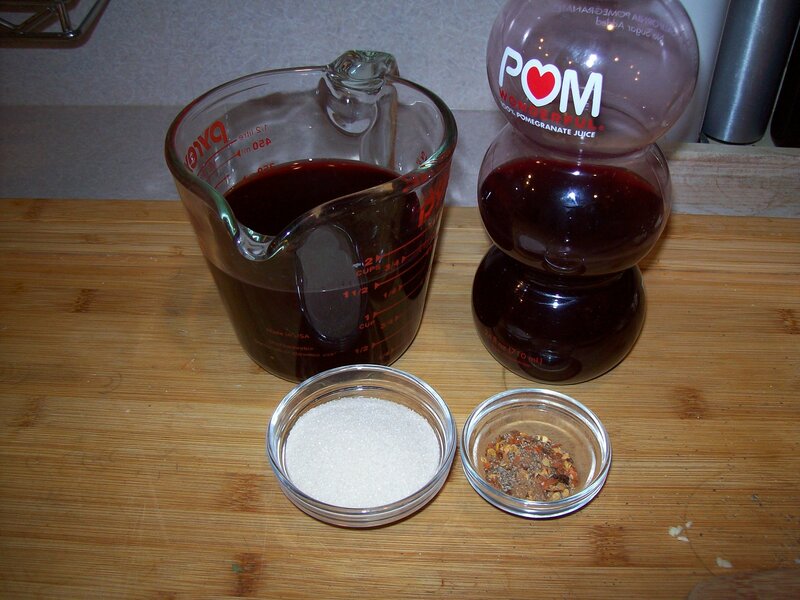 Combine pomegranate juice, sugar, 1/2 tsp. 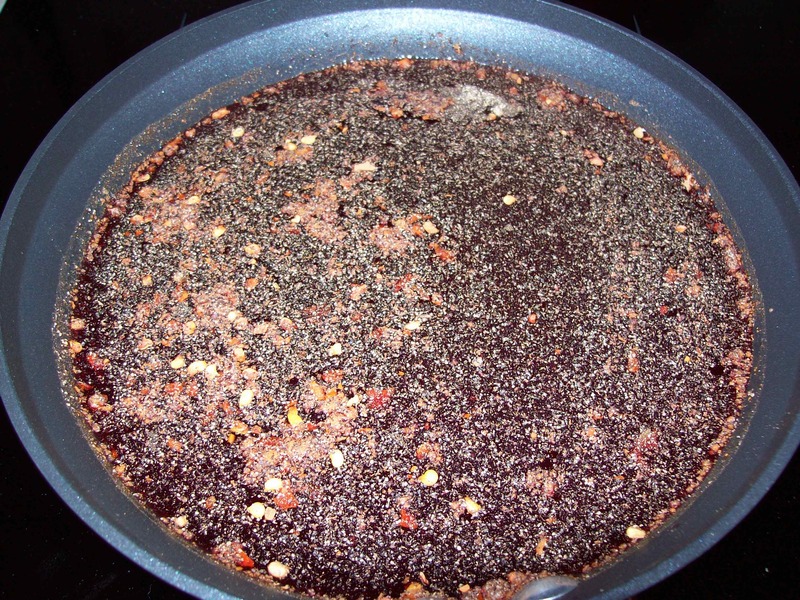 of the black pepper, red pepper flakes, and cinnamon in a medium saucepan and bring to a boil over high heat. 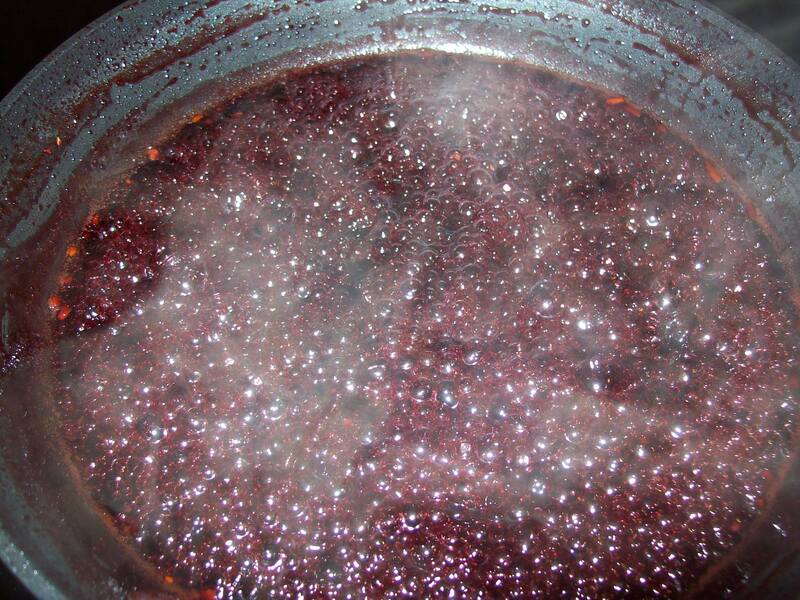 Reduce heat to medium-high and simmer until mixture is thick and syrupy and reduced to about 1/3 cup, about 20 to 25 minutes. 3. Cut carrots and parsnips in half lengthwise and then cut into 3-inch pieces. Place in a microwave-safe bowl with water. Cover with plastic wrap and microwave for 2 minutes. Remove plastic wrap and toss vegetables with 2 Tbsp. of the pomegranate glaze. 4. 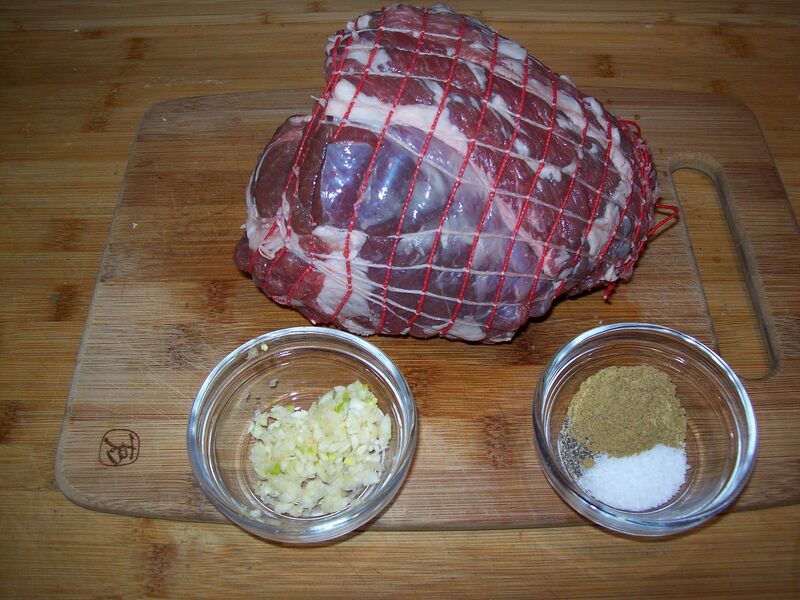 Place lamb in the center of a large baking dish or roasting pan. Rub garlic into roast. Season with 1/2 tsp. of the salt, remaining 1/2 tsp. black pepper, and cumin seeds. Brush the top and sides of lamb liberally with pomegranate glaze. Distribute vegetables and their liquid around the roast. – STEVE NOTE – I rubbed the roast with garlic and the spices wrapped in plastic wrap and set in refrigerator for a few hours. Took out and let get to room temperature. 5. Roast for 40 minutes, stirring vegetables once or twice, until meat is cooked to about 115 degrees. Brush roast with any remaining glaze (if it has thickened, microwave for 15 seconds). Increase oven temperature to 500 degrees. Cook until meat begins to brown in spots and the temperature reaches about 125 degrees for medium-rare, 140 degrees for medium, and 160 degrees for well done, according to your preference (about 10 to 20 minutes). 6. If you prefer your lamb more well done and it begins to overbrown, lower heat to 475 degrees and cover meat loosely with foil. 7. Transfer lamb to cutting board, tent with foil and let rest for 15 minutes. Meanwhile, spread vegetables evenly over baking dish and return to oven to bake until all the juices have evaporated and vegetables have begun to caramelize, about 4 to 5 minutes; watch that they don’t burn. Remove baking dish from oven and stir butter and mint into the vegetables. 8. Remove strings and use a sharp knife to cut lamb into thin slices. Transfer vegetables and lamb to platter and serve warm.